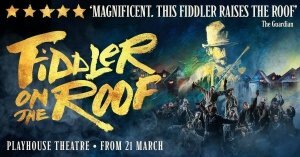 Joining Andy Nyman (Tevye) and Judy Kuhn (Golde) to complete the West End company of Trevor Nunn’s critically acclaimed production of Fiddler on the Roof are Nicola Brown (Chava), Harriet Bunton (Hodel), Dermot Canavan (Lazar Wolf), Stewart Clarke (Perchik), Joshua Gannon (Motel), Matthew Hawksley (Fyedka), Louise Gold (Yente), and Molly Osborne (Tzeitel), as well as Miles Barrow, Sofia Bennett, Philip Bertioli, Lottie Casserley, Elena Cervesi, Lia Cohen, Talia Etherington, Shoshana Ezequiel, Isabella Foat, Fenton Gray, James Hameed, Adam Linstead, Adam Margilewski, Robert Maskell, Benny Maslov, Robyn McIntyre, Gaynor Miles, Ellie Mullane, Tania Newton, Craig Pinder, Valentina Theodoulou and Ed Wade. The production transfers to the reconfigured Playhouse Theatre from 21 March for a limited run – with over 25,000 tickets at £20 or less across the run. The production, which opens on 27 March, with previews from 21 March, and is booking until 15 June, is currently running at the Menier, where it completes its sell-out run on 9 March. Featuring the iconic score including ‘Tradition’, ‘Matchmaker, Matchmaker’, ‘Sunrise, Sunset’ and ‘If I Were a Rich Man’, and featuring original choreography from Tony Award-winning Jerome Robbins alongside new choreography by Matt Cole, Fiddler on the Roof ‘bursts from the stage’ (Financial Times), bringing new life to one of the most beloved musicals of all time. Director Trevor Nunn; Choreographers Jerome Robbins & Matt Cole; Set Designer Robert Jones; Costume Designer Jonathan Lipman; Hair and Makeup; Designer Richard Mawbey; Lighting Designer Tim Lutkin; Sound Designer Gregory Clarke; Musical Supervisor & Director Paul Bogaev; Orchestrations Jason Carr.